This cottage has a great holiday feel with a large open plan living area with high ceilings. There are 2 double bedrooms and a mezzanine sleeping area that the kids and teenagers will love bringing the maximum sleeping capacity to 6. There are 2 bathrooms and an outside space for a bbq. The Studio is located right in the centre of town on a beautiful cobbled street. On the ground floor to the left of the entrance hall is a bedroom with double bed (this room also has a single sofa bed which can be made up if requested). There are two steps up to a very large open plan living room with dining area. There is a kitchen area to the back of the living room which then leads onto a small terrace with table and chairs. There is also a family bathroom with bath and shower on this floor. On the first floor there is a spacious and light master bedroom with superking size bed and en suite shower room. There is a mezzanine sleeping area above the kitchen/living room with 2 single beds which is ideal for teenagers - no children under 9 are allowed up here unaccompanied by an adult at all times because the steps leading to the mezzanine sleeping area are very steep. Also, please be aware that there is a large skylight in the living room ceiling so the mezzanine becomes light early in the morning during the summer months. This cottage used to be an artist’s studio so it has a very interesting, spacious and light feel. It is situated right in the best part of town so you can just walk everywhere and don't need a car at all. There is no private parking at the property but most of the streets around have unrestricted parking. Well behaved dogs are welcome at an additional charge of £25 per dog. Puppies are not allowed and dogs must not be left at the cottage unattended. Please leave the house in a clean and tidy condition at the end of your stay with all washing up done and bins out. This holiday let house does not come with household basics so you please add tea, coffee, toilet roll etc to your shopping list. There is a travel cot at the house if you need one but you will need to bring all sheets and bedding to suit your baby. I am a local Arundel lady with 3 children who manages a number of properties of all sizes in Arundel. Do feel free to give me a call to discuss your particular requirements. I am always on-hand with help and advice and will do my very best to make sure that you have a wonderful holiday! We bought this house because it is right in the centre of Arundel and has a wonderful holiday feel! This cottage has a wonderful casual holiday feel. One of the great things about this location is that you don't even need a car while you are staying as everything is a short walk away. The master bathroom has an en suite shower room with toilet and sink. The family bathroom is located on the ground floor and has a bath with integrated shower, toilet and sink. The living room has high vaulted ceilings and a large sofa bed which seats 3, a loveseat which seats 2, TV. The kitchen has a cooker, hob, fridge freezer, microwave and practical cooking accessories. There is a table that sits up to 6 guests. There are lots of books to enjoy, if you want to take a paperback home please feel free to do so but replace it with a book in good condition. The terrace is approximately 30ft long x 6ft wide on different levels so you can sit in the sun or sit around the garden table for drinks. There are public tennis courts nearby. Exactly as described. Well equipped, and convenient for the town centre. 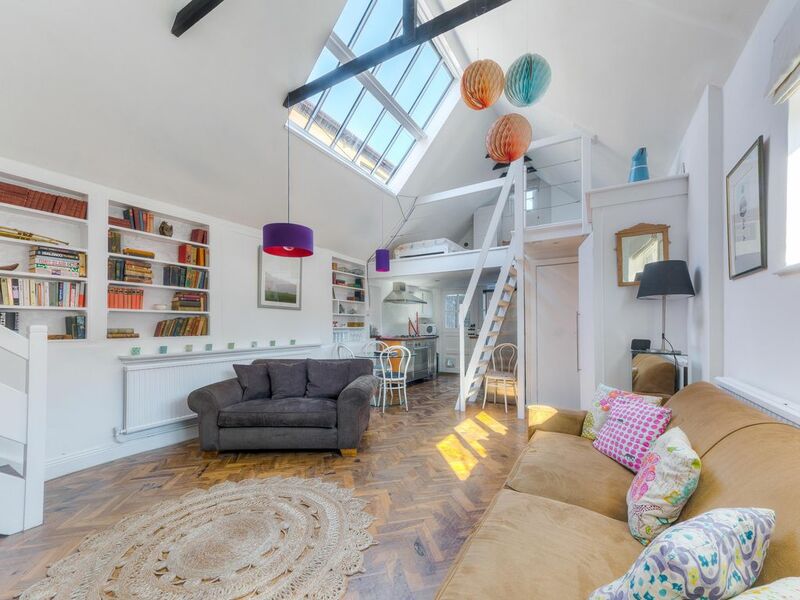 Two good bedrooms and a mezzanine suitable for two teenagers (steep ladder). Excellent base for exploring Sussex. Owner very helpful. Thanks for your nice review Wain it is so much appreciated. The property itself was great: bright, spacious, comfortable. The location within Arundel was perfect. The parking outside would not be for everyone but suited us fine. The only problem was the OwnersDirect booking system which seems to be designed to put people off using it. Thanks for your very kind review I really appreciate it and I totally agree that the new OD system needs to be simplified to make it easier for guests to use. Lovely cottage in a beautiful town! I stayed here with friends for three days and it was lovely! Having an open-plan living space was great for the evenings and the bedrooms and bathrooms were really well laid out with nice details - the whole design was beautifully done and well-maintained. The Studio is in a great location in Arundel, making it very easy to explore this interesting town. A wonderful experience! Thank you so much, I'm really glad that you enjoyed your time at my cottage. So good we returned to take another few weeks! A perfect location right in the heart of Arundel offering a well equipped and cosy accommodation. We thoroughly enjoyed our stay here; in fact, so much so that we returned for a second holiday within just a few months. Most importantly, the host is absolutely fabulous and nothing is too much trouble for Laura. Her ultimate aim is to ensure you have the most amazing holiday possible. Thank you so much for everything. Oh that's a lovely review - thank you so much. The studio is lovely - it has a very nice atmosphere and is perfectly positioned in the heart of Arundel. It was clean & the bed in the master bedroom was very comfortable. We would consider staying again! We rented the cottage for 3 weeks in the fall of 2015. Had such a wonderful time and were able to invite our UK friends from Southern UK to visit us. The location was perfect for our walkabouts in Arundel, and close to many of the places we wanted to revisit from the time we lived there. We rented a car, but never had to drive anywhere since the village was so convenient. Parking could have been a problem since the street the cottage is on is very narrow. But the neighbors made us welcome and specifically pointed out a place we could park at the cottage at all times. Be sure to check out the Kings Arms Pub across the lane for friendly drinks and conversation. We were made to feel very welcome. The owners are superb and very available to answer questions and sort things out. It was a special stay in a special place. The cottage is approximately 15 minutes from the nearest beach - Clymping but there are many beaches along the coast - Littlehampton, Middleton and a little further away the glorious sandy beaches of West Wittering. Arundel is approximately 50 minutes drive from the nearest airport (Gatwick). It is not necessary to have a car in Arundel as it is a small town where you can walk everywhere! Dogs are welcome but they are not allowed on furniture. There is a £25 charge per dog.